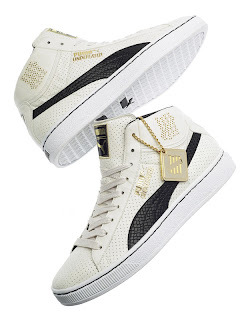 Puma has partnered with Undefeated to bring you a variation of the Puma Mid. The shoe will come in four different color variations including black, white, maroon and royal blue. The shoe will also come in a limited 72 pair run of the 24k gold version exclusive to Undefeated chapter stores and retail for $125 USD. Shoe drops on February 7 at selected retailers including Classic Kicks, Alife and Atmos in NYC, Major in DC, UBIQ in Philadelphia, Premium Goods in Houston, Leaders in Chicago and Bodega in Boston. 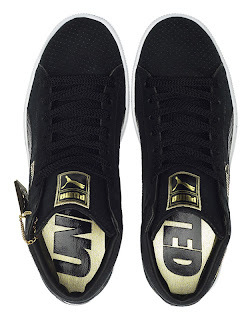 The shoe will also be available at UNDFTD chapter stores.